Clock Cleaners (1938), directed by Ben Sharpsteen. This is the sixth of 21 essays inspired by a list of 250 great animated short films, composed in August 2012 by Scott Bussey, Jorge Didaco, Waldemar Hepstein, Bill Kamberger, Robert Reynolds, Sulo Vatanen, and Lee Price, with additional assistance from participants on the IMDb Classic Film message board. In both short films and long, the lead characters are usually attractive, healthy, and relatively free of the demands of work. If they do work, they’re likely to be soldiers, policemen, criminals, or prostitutes. Rounding out this cinematic snapshot of society, there are the lawyers, doctors, and performers. The bit roles go to the nurses, waiters, cab drivers, librarians, accountants, etc. who come from the ranks of the remaining 90% of the population, performing jobs that apparently aren’t sufficiently glamorous for the big screen. And that’s why I want to share a word of praise for Mickey Mouse, the hardest-working cartoon character in the movies. Mickey started out piloting a steamboat and went on to pump gas, wash windows, sell hot dogs at a carnival, drive a train, fight fires, deliver groceries, operate a steam shovel, and many more respectable yet common occupations. As the Disney animators found themselves emphasizing Mickey’s superb work ethic, their star mouse unfortunately dropped into the category of “responsible adult” when other cartoon characters were present. As a result, sidekicks Goofy and Donald became the fun characters, stealing much of Mickey’s initial popularity. When Disney got around to filming Mickey’s Christmas Carol (1983), our ever-dependable mouse naturally took the role of Bob Cratchit, the quintessential guy who does all the work and never gets the credit. So happy belated Labor Day! I’ll give this handful of movies all the more credit for acknowledging that most of us have to get up and go to work every day. Clock Cleaners (1938): This is working-class Mickey at his peak. 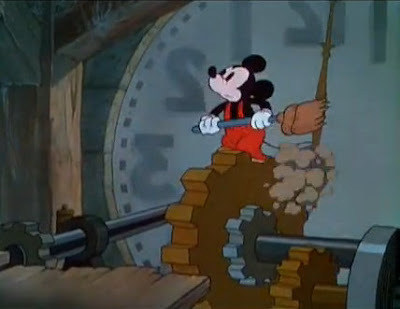 A classic Disney cartoon, Clock Cleaners is set in the everyday urban work world, with Mickey, Goofy, and Donald Duck reporting to duty on a clock face perched dizzyingly high above the city. Naturally, this is a setup designed to generate thrills in the tradition of those famous building-climbing stunts of Harold Lloyd in silents like Safety Last (1923). And it has another forerunner in the wonderful Popeye cartoon A Dream Walking (1934) which shifted the Lloyd gags from the real world to the cartoon world, with Popeye, Olive Oyl, and Bluto mixing thrills with comedy at skyscraper heights. If it weren’t for the cartoons, slapstick comedy of this kind would have been largely abandoned in Hollywood’s transition to sound. Producers looked to Broadway dialogue writers for verbal wit, largely abandoning the art of slapstick comedy. But Charlie Chaplin, Buster Keaton, Harold Lloyd, and other masters continued to inspire short cartoons like Clock Cleaners, where timing and pantomime counted for everything. Fortunately, Mickey, Donald, and Goofy (and their fabulously talented animators—Disney still had some of its finest working on shorts at that time) had skill and charisma to rival their silent forebears. Support the artists and the art of the animated short film! Clock Cleaners is available for purchase on Walt Disney Treasures: Mickey Mouse in Living Color. Three Monks / San ge heshang (1982): Three Monks would be an ideal choice for a video to show at a staff meeting focused on team building. These monks may not have particularly demanding jobs, but their work environment is very familiar office terrain. Our three prayerful protagonists hold grudges and resentments, jealously guard their turf, sneakily enjoy the discomfort of their co-workers, and even sabotage each other’s work. Thanks to the skill of director Xu Jingda (A Da), all of this is communicated swiftly and charmingly. We find the three monks endearing even as they behave poorly. The lesson for that staff meeting comes at the end when creative teamwork wins the day. Even monks can be friends. And if harmony can even be established at a monastery, there’s hope for work places everywhere. Support the artists and the art of the animated short film! Three Monks is available for purchase. This Way Up (2008): Now here’s a cinematically under-represented profession: funeral director! And no one could represent the undertaking profession more ably than the two determined casket bearers in Adam Foulke’s and Alan Smith’s This Way Up. Like a modern-day Tex Avery cartoon (see King-Size Canary and Bad Luck Blackie for reference), the gags become increasingly wild and outlandish as the short progresses. The stoicism and practicality of our two heroes offer a perfect counterpoint to the black comedy. While the gags are creepier than you’d ever get in a classic Disney cartoon, This Way Up sets up a similar type of situation to those that were handled with aplomb by Mickey, Goofy, and Donald back in the 1930s. Can’t you picture Mickey and Goofy carrying the coffin, circa 1936, in a short called something like Mickey’s Funeral Service? Yet even though different times deserve different heroes, it’s nice to see that unflagging professionalism and good old-fashioned depression-era work ethic are still with us today. Support the artists and the art of the animated short film! This Way Up is available for purchase on the Best of Animation 4 DVD. Here’s a list of some other films from our list that touch upon themes of work and labor. I wish this list was longer, but these were the best I could find!